There are all types of friendship in our world today. Relationships between friends rests on mutual trust and support from one another. Recently we met two women who had a very special state of friendship that touched our hearts. Both women were widowed and wanted to make something special to wear everyday in memory of their husband. 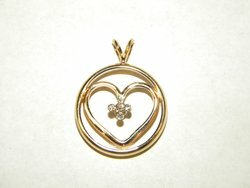 They decided to take the diamond from their engagement ring and set it in their husband's ring in a pendant. 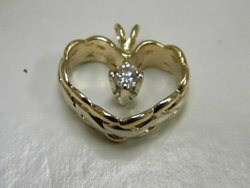 One of the wedding bands had a woven pattern which was shaped into a heart with the diamond set in the center. The other wedding band was left round with a her band formed as a heart within his band and the diamond placed at the center. The unveiling was so special and each friend wears the new necklace with fond memories and peace of heart.